Well, objectively the install is a success. Running "furmark" would rocket the GPU up to 80-90C in short order. It graphs GPU temp over time, and up to around 70 or so it looked like a shuttle launch - near vertical. 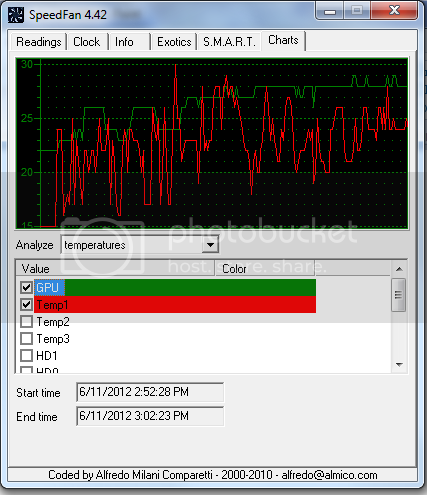 CPU temp: 47, cores ~ 55-58. After shutting off furmark, my temps have dropped to CPU 44, cores 53-56. And that's with only 2 fans on the radiator so far...have room to mount 2 more. Now we'll have to see if pumping that heat out of my office was worth it...it'll take a nice night of racing/flying to determine that. Worked out about as well as I could've hoped. Room stays considerably cooler in closed-door gaming. It still gets a little warmer in here, of course, but that's not unexpected...me, the monitor, and the rest of the PC are all still throwing off some heat...it will warm up. Now, however it's "a couple" of degrees (F) warmer in here after 2-3 hours in a game, rather than 10-15. I have also tested and found my system stable under burn-load with the CPU at 4.2ghz (I normally run it at 4.0...and it's a 3.06 rated proc) and the GPU up to 900 (I run it at 800, stock is 675). Very nice results! Running nice and cool. The GPU temps being that low are the most impressive, especially since the GTX 460 is known to run hot (even idle)! Would love to see a picture of your case and setup/routing. On another note, I just found a great deal on a EVGA GTX 670 (FTW Edition) card. The FTW is on par with its big brother GTX 680 reference card, actually a slim margin faster boost clock but with fewer CUDA cores (1344 vs. 1536). It should still overclock 5-10% overhead stock speeds. For comparison's sake a pair of GTX 580s in SLI benchmarks lower than a single GTX 670 (CUDA cores: 1344 vs. 512 x 2, and the clocks are also higher on the GTX 670/680). Best bang for the buck in the high-end GPU market right now: GTX 670! Ugh. Case is all closed up now. Routing is ugly because I used cheap vinyl tubing (~ $0.30 / foot) instead of the gamer-grade tygon stuff at $2-3 per foot. The vinyl works for me, but doesn't do sharp bends (kinking) etc. It is NOT a "clean" looking layout. In short, I have tubing coming in one of the cutouts in the case on the back, running to the pump which is sitting in the upper 5-/14 bays (under the "dock"). Out from the pump into one side of the CPU block. Out the other side of the CPU block into the GPU...out the GPU, out the case, through the floor to the basement radiator, then back up to the reservoir on my desk.